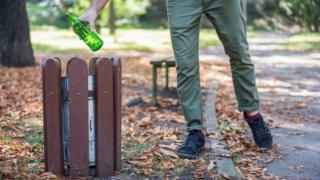 A councillor is to request a ban on litter picking be lifted in rural villages near areas affected by last year's Novichok poisoning. Guidance issued after the nerve agent poisonings in Salisbury and Amesbury states "if you didn't drop it, don't pick it up". Richard Britton said he will write to Public Health England (PHE) to ask for current guidance to be changed. Mr Britton said there was "a case" for the existing restrictions to be lifted. Earlier this month Mr Britton told people living in several nearby villages they could arrange community litter picks as part of a Keep Britain Tidy's national Great British Spring Clean event to be held on 22 and 23 March. But Wiltshire Council said the events could not take place due to restrictions still being in place. Mr Britton said: "It's not for me to go against guidance of a statutory body, it would be irresponsible to recommend villagers go ahead [with a litter pick]. "However, while there is still a case in Salisbury and Amesbury, I find it difficult to see why the advice should be maintained in the rural villages." He added he would "take steps to get the ban lifted" by contacting PHE and asking Conservative MP for Salisbury, John Glen, "to look into it". "I don't think there's an appreciation of how important these litter pick events are in communities." Alistair Cunningham, chair of the recovery coordinating group (RCG), said: "The PHE guidance, which is 'if you didn't drop it, don't pick it up', still stands in Salisbury, Amesbury and the surrounding areas. "Wiltshire Council is providing additional litter picks in the south of the county until such time as the guidance is reviewed." Former Russian double-agent Sergei Skripal and his daughter Yulia collapsed in Salisbury after being poisoned last March. Dawn Sturgess and Charlie Rowley were also exposed to Novichok in nearby Amesbury. Ms Sturgess later died.